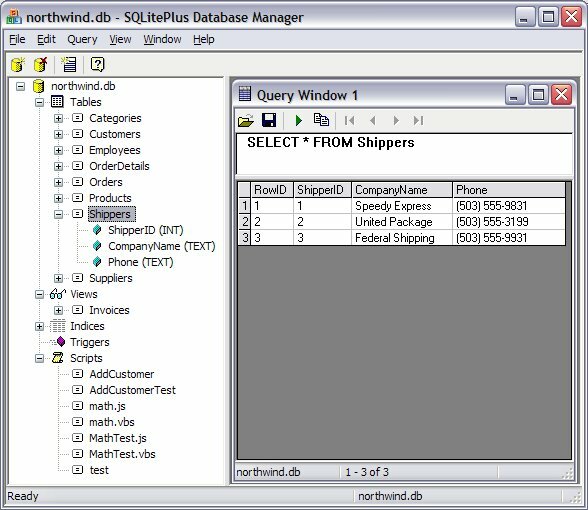 Use SQLitePlus Database Explorer to view/edit your SQLite databases. SQLitePlus Database Explorer is similar to SQL Server Query Analyzer. You can create/drop/view Tables, Views, Triggers, and Indexes, and also issue SQL queries and commands to view and otherwise manipulate your data. The data is displayed in a grid control, allowing you to copy the data to files or other programs. With the purchase of a SQLitePlus license you get the full version of the Database Explorer. In all, SQLitePlus Database Explorer is a valuable tool for working with SQLite databases. FYI, all database access in the Admin tools is done using the SQLitePlus COM DLL.